Here in SW France duck is very popular – from Cassoulet to confit. 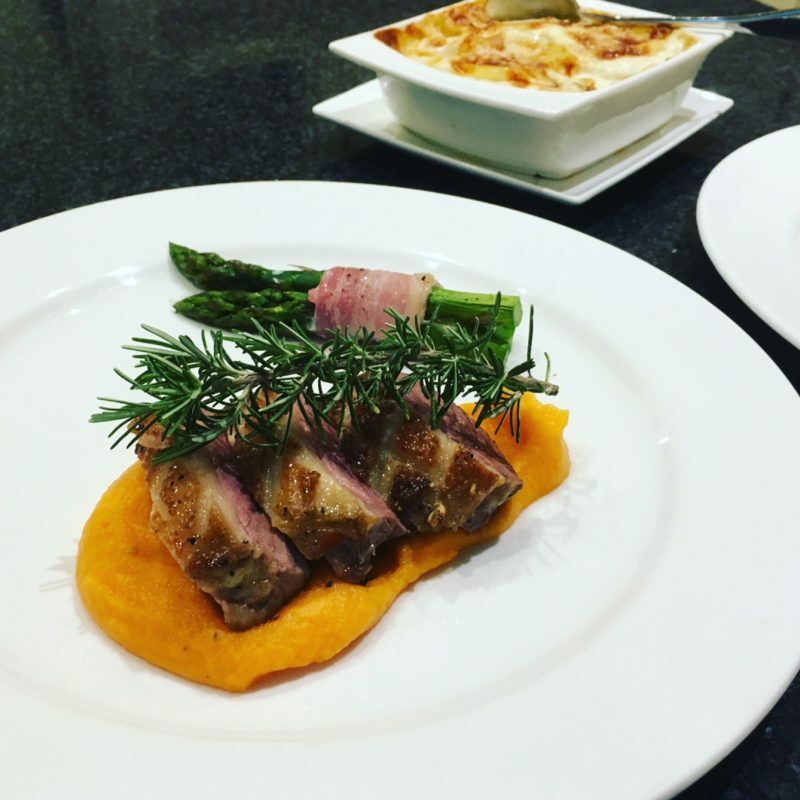 Many guest tell us they have never mastered cooking a duck breast so here’s our recipe and a couple of ideas of the perfect accompaniments too! Generally speaking, a large duck breast will serve two as a main course. Look for ones which are not too fatty and nice and plump. If you are in France, a “fillet” of canard as opposed to a “margret” are my personal preference. To prepare, using a sharp knife, score the fat of each breast 1cm apart from right to left and then repeat in the other direction so that you have a crisscross pattern (the reason for doing this is to help render off the excess fat during the cooking process). Heat your oven to 180 degrees and line a roasting tin with foil. Season the duck with salt and pepper. Heat a large non-stick frying pan (without any oil) and when hot, place your duck breast skin side down for around 20 seconds, then turnover and sear the meat itself for the same time so it is just browned. Turn again for roughly 20 seconds more, or until the fat starts to colour nicely. Remove from the pan with a pair of kitchen tongs and drain off as much of the fat pack into the pan as possible. (if you are cooking multiple breasts, you may need too pour the fat into a heatproof jug or container in between – save the fat for perfect roast potatoes). Place your duck breast(s) skin side up in the roasting tin and pop in your pre-heated oven for 20 mins for pink (duck does tend to start to toughen if overcooked). Remove from the oven and take the duck out of the roasting tin and cover with foil on your chopping board and rest for a few minutes. You should get six nice thick slices from each breast. Use a sharp knife and then place the slices onto some kitchen paper to absorb excess juices before plating up. Please click here for information about dining at La Villa. Win a superb lunch for two! Traveller's Choice Winners... for the 9th successive year ! 30,000 Visit Mazamet's New Passerelle.... including us ! 2018 Les Amis Christmas Raffle ! Win a Year's Subscription to FRANCE Magazine ! Planning a cycle trip for 2019? - look no further than Mazamet! Give yourself the Zenergy you deserve ! When your travels take you further afield, look no further than Further Afield ! Celebrating a special anniversary or birthday in 2019.... La Villa could be all yours ! Les Amis de La Villa - 2018 intake closes September 30th ! So, you would love to stay at La Villa – but how do we travel to Mazamet? So, what is there to do in and around Mazamet? Sign up for our monthly E-newsletter to receive exclusive offers, recipe ideas and the latest news from La Villa.